Australia are top of the annual Test rankings for the first time since August 2009 thanks to series wins over South Africa and England. They remain the leading one-day side, and hold the International Cricket Council's number one spots in both formats for the first time since 2008. Captain Michael Clarke said: "We are incredibly proud. There's been an enormous amount of work and effort." South Africa slip to second, while England are up one place to third. Australia have improved after a difficult period last year when they were beaten 4-0 by India and sacked coach Mickey Arthur only 16 days before the start of an Ashes series they went on to lose 3-0. 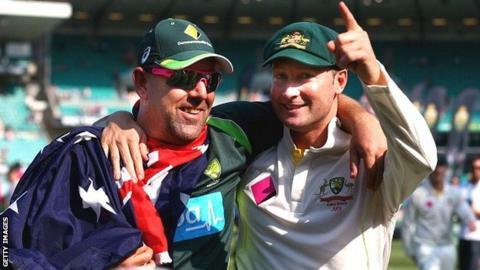 Arthur's successor, Darren Lehmann, quickly turned things around, regaining the Ashes with a 5-0 series win over England down under over the winter and securing a 2-1 series victory over South Africa, then the number one-ranked Test side. Clarke added: "The true test of a great side is sustained success and now our goal is to maintain these rankings and continue to play great cricket." South Africa held the number one Test spot since August 2012, Australia have edged ahead by a fraction of a point. The ODI rankings remained largely unchanged, with Australia ahead of India and Sri Lanka, while India reclaim top spot in the T20 rankings from Sri Lanka despite losing to them in the World Twenty20 final in April - their only defeat in the last year. Read more on Ashes 2013-14: Where next for England after 5-0 whitewash?